PH0004983/278 - FIRST DEVON & CORNWALL LTD, THE RIDE, CHELSON MEADOW, PLYMOUTH, PL9 7JT Variation Accepted: Operating between THE GEORGE PARK AND RIDE SITE and PLYMOUTH (Royal Parade) given service number PR1 effective from 15-Jul-2014. To amend Timetable. 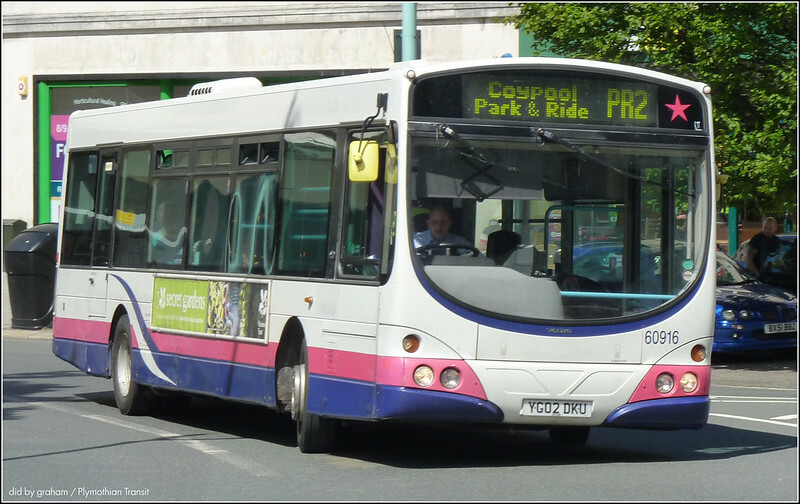 PH0004983/294 - FIRST DEVON & CORNWALL LTD, THE RIDE, CHELSON MEADOW, PLYMOUTH, PL9 7JT Variation Accepted: Operating between Coypool Park & Ride Site and Royal Parade given service number PR2 effective from 15-Jul-2014. To amend Timetable. We're running extra Park & Ride buses for MTV Crashes Plymouth on Tuesday 15 July! MTV will be 'crashing' Plymouth Hoe this summer to stage a spectacular live music event as part of the city's 'Three Towns' centenary celebrations. Organised in collaboration with the City Council, 'MTV Crashes Plymouth' will take place on 15 July and feature a number of headline music acts including Kaiser Chiefs, Example, The 1975 and Kiesza. 20,000 tickets have been sold so there will be a lot of traffic and parking will be limited. So were running extra evening Park & Ride buses to take the strain getting into the City Centre for the show and then getting home afterwards! LIKE DUCKS TO WATER.... London Duck Tours returned to the waters of the River Thames on the 8th July after several months of confinement to land only operation. Council check: Norfolk Each Sunday, we judge how well one of our local councils is promoting the bus services in its area. Today, we look at Norfolk County Council. There are some changes on VOSA for Citybus yet again. From what I can tell services 40/41 and 42 plus Blue Flash, from end of August, any ideas what these could be ? Changes also listed for the 5,29 and 43. Western Greyhound appear to have lost the number 79 Tavistock to Callington. First to operate this from September accordiong to VOSA. Also another 2 new routes in Cornwall i think, gained from WG too ?? ?